Wow, that example with Yogananda was both clarifying and inspiring - thanks for sharing that example. Rad I have another question specific to the intentions of the semi sextile and the semi square - both balsamic and new phase. I have two charts here that I want to exemplify to see if I understand clearly the specific requirements of planets in these phases to the nodes. In my experience counseling these two clients, I feel I grasp a good deal of the story and yet would like some support in understanding the true implication of these aspects. 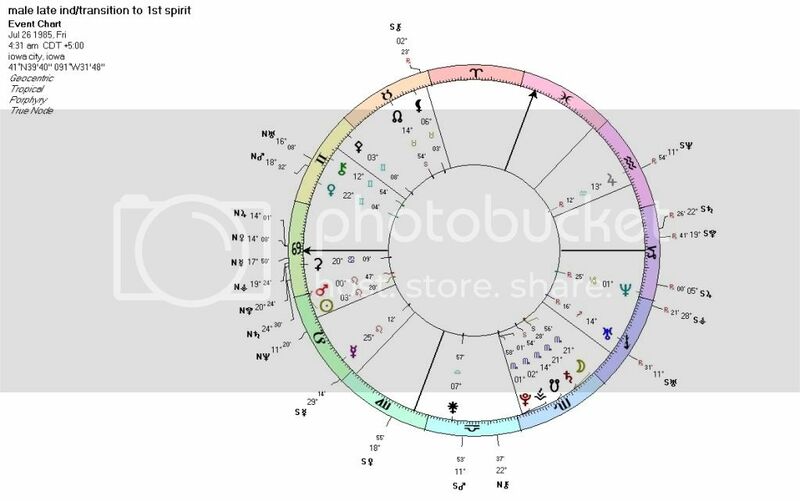 This first chart we have Saturn in Scorpio in the 12th in a balsamic semi sextile to the sn in Sag in the first. That Saturn is ruled by Pluto which itself is almost an exact balsamic semi square, (though still last quarter) to the sn as well. The first thing, given the nature of these aspects occurring in the balsamic phase and also relating the 12th house to the 1st house point to a core humility and surrender that this soul is focusing on intensely in this life. In prior lives there was an over emphasis on his own individual spiritual purpose and capacities which translated to the misuse of his own authority, taking on responsibility for the masses but lacking in the appropriate credentials/skills that he overlooked relative to his own egocentric spiritual narcissism (sn in first, ruler Jupiter conj Neptune and sun relative to the Saturn semi sextile to that sn). This all implies that this soul is requiring a limitation and focusing of effort via the appropriate discipline and training b4 he can set forth to do what he wishes to do in this life. That Saturn being ruled by Pluto which is on the cusp of the balsamic phase to the sn and also just on the cusp of the 12th house means that this soul has the choice to stop resisting his own evolution by way of his karmic pattern of overcompensation via spiritual ideas and over idealizing his own purpose. The intention is to limit his options and focus on the appropriate path (by way of generating the desire to do so) that will allow for him to evolve beyond his previous deeply rooted insecurities. The nature of these insecurities being about dissolving and surrendering his freedom into the whole by way of a form of service that will allow him to fully commit to a path of soul work. This signature points to prior lifetimes where he has gotten involved in all kinds of spiritual paths and has sought to merge and dissolve his own identity, and yet has resisted that disillusionment by way of maintaining an exaggerated identity of who he is and what his purpose is all seemingly under the guise of merging with the whole and yet was in fact a way of maintaining his separating desires. That's just the general sense of it- of course there are more archetypes involved - in particular these planets relationship with the nn and other aspects. I just want to see if I am actually on the right track here and am interpreting the meaning of this signature accurately. This question came up for me with regard to Upasika's question about the "throwing off" quality to the opposition. But I think it is a question that in my mind applies to all aspects. The question is: in trying to determine just what is being thrown off, do you focus on the faster moving planet to determine what that most likely will be? And so, in terms of the other aspects, is the leading planet the "clue" to what is going on? A consideration must be made relative to core signature of the two planets in opposition. The two planets in opposition correlate to the core or root of that which is being 'thrown off' yet that root will likely be connected to those two planets being is aspect to other planets. If so, then those other aspects will correlate to branches that are connected to that root. In essence, that which is being thrown off in order for the evolution of the Soul to proceed is symbolized by both the planets, houses and signs that the root correlates too. As this throwing off process occurs it then allows all the related dynamics symbolized in the other planets/houses/ signs that are connected to this root to also evolve because the blocking force of that which must be thrown off has or is occurring. In this second chart of a male third individuated, transitioning to first spiritual - Neptune is in Cap in the 6th in a crescent phase semi square the sn in Scorpio in the 5th. This would correlate to prior lives where the soul had been neglectful of various work responsibilities by way of ignoring the necessary details because of who he considered himself to be, not picturing it necessary or important to do such things given his royalty like status (or self image of having such a status), or some sort of justification that is linked to the psychology of Scorpio in the 5th house (narcissism, personal power and self importance). Because of this neglect and laziness there were all kinds of crisis that the soul was not prepared to cope with due to its fixation on being "above and beyond" dealing with such crisis. Thus the imperative of the semi square in this life is to limit his arrogance by way of developing humility and a path of service that allows him to focus on all the necessary details for a higher purpose than himself. The ruler of Neptune being conjunct the sn as well as the Moon. This implies this will specifically have a correlation with prior family dynamics, in particular children to whom he neglected/deprived attention. The resolution in this life is to align with a path of service, karma yoga, that will allow him to give the attention and emotional support for children - or whatever population would fit into the archetype of the Scorpio 5th house. In so doing he is accepting the requirements of that Neptune in Capricorn in the 6th in a crescent phase semi square to the sn in Scorpio in the 5th. He will also re-encounter various souls who were his own children in the past in order to resolve these dynamics. Thank you, Rad! That was VERY clarifying! 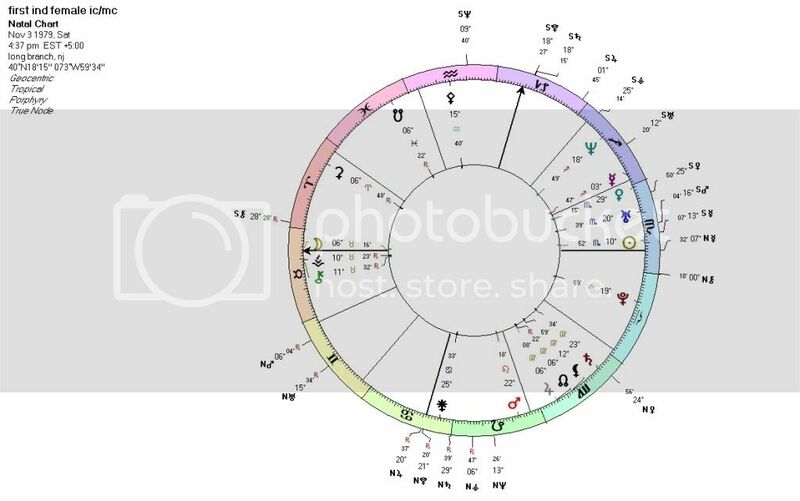 (i) My understanding is that aspects from natal planets to the SN or its ruler correlate to past life dynamics that provide information regarding the past leading up to the current life being lived. Accordingly, unlike aspects between natal planets (which correlate to the current life intentions of the planetary pair in question), aspects to the SN or its ruler provide a “glimpse” into the Soul’s past and acting them out again in the current life would lead to stagnation. Is this correct? (ii) Since in the majority of cases a planet in aspect to the SN would also form an aspect to the NN (the aspect that is opposite to the one involving the SN), is there any correlation we can make to the idea of polarities indicating the way forward as far as aspects to the nodes are concerned? For instance, using the balsamic semi-square that Ari referred to (not necessarily the charts posted above), let’s suppose Saturn is making a 314 degrees aspect to the SN (balsamic semi-square but still in the last quarter phase). 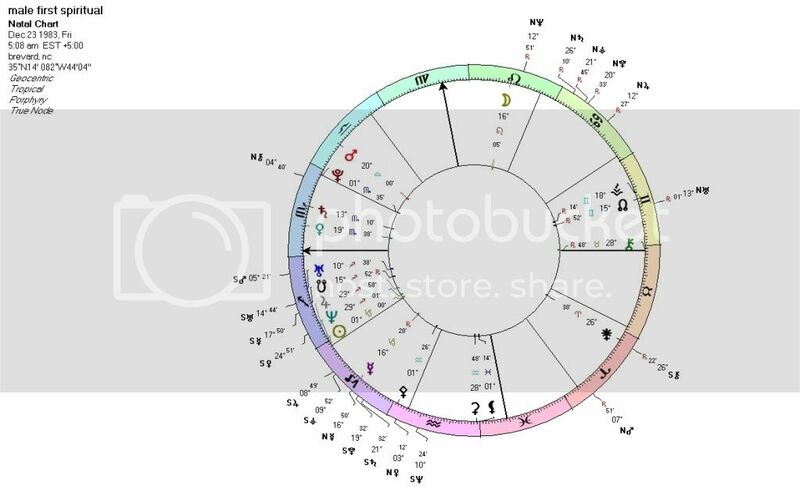 Of course this aspect needs to be interpreted in the context of a person’s entire chart, but nevertheless we can infer from it that in its past the Soul wanted to have the freedom to initiate whatever experiences were considered necessary so as to get closer to the distant horizon it inwardly sensed. Furthermore we can assume that the external obligations and duties that were inherent to the establishment of the Soul’s personal authority within the context of society (Saturn) were perceived to be very annoying and were viewed as potential detours that prevented the Soul from getting to that distant horizon that promised only freedom. Since this is the orientation that the Soul is bringing into the current life, is it correct to say that the solution to the limitations implied by the past (which are symbolized by the Saturn semi-square to the SN) is represented by the aspect Saturn is making to the NN, i.e. a first quarter sesquiquadrate (134 degrees)? This would mean that in the current life the Soul would need to acknowledge how the system works, to go through the necessary training and activities and the not-so-glamorous details of one’s everyday life in order to establish its personal authority. By doing this, the person would also experience necessary humility as he/she may have been overly identified on an egocentric level with the vision of the distant horizon. Is the above correct and if so, can we generally look to the aspect a planet is making to the NN in order to determine how evolution can proceed beyond the limitations suggested by the aspect from the same planet to the SN? (iii) If a chart has skipped steps and a planet is making an aspect to both nodes, can we say that in the past the person has flip-flopped between the dynamics symbolized by the two aspects (in the example above – a last quarter semi-square and a first quarter sesquiquadrate) and is meant to constantly focus in the current life on the aspect that is formed between the respective planet and the resolution node? Thank you - that, plus your answer to Ellen, adds a dimension to the opposition that makes a lot of sense. It is interesting that in a grand cross, the oppositions are the skeleton, bones, of the configuration. Would it be right that all the planets/points in a grand cross will tend to repeat the same old separating desires, maybe dressed up in different garments (situations) time after time again, repeatedly, until the Soul sheds the outworn desires of both the oppositions simultaneously - en masse? In other words because each planet in a grand cross is so interwoven with all the other planets, they would tend to lock in on each other preventing just a couple of planets, from moving forward into new desires by themselves - the other planets would hold them back in the pattern (of the four planets together). Therefore dropping old desires would tend to be much harder to do. The person may keep initiating experience (according to the mode of the cross) that maybe was new in the sense of another completely fresh new venture - yet it was just another reflection of the same old desires - time after time again, endlessly. Thus a person with a grand cross, due to the oppositions, would always have strong sense of change in desires being needed (and also due to the creative/developmental stress involved in a cross), and may even know what those changes needed to be, but find their patterns based around the old familiar desires too strong for small incremental changes (related to just two of the planets involved). Thus the person would need to see and grasp the entire complexity of their pattern - of pursuing the same old desires of both oppositions - at a much deeper level, and throw (or more like literally "heave") the old desires and their patterns around pursuing/expressing those desires, off in one huge massive chunk, before they could really move into truly fresh new virgin desires involving all the planets/points of the grand cross. Hence the "explosion" (inner, outer or both). Not sure if I've explained this very well, but would this accurately describe the way the dynamics of the oppositions would tend to be conditioned by being within a grand cross, as far as making the Soul aware of the separating desires not needed anymore, and the resulting affect on the person? Thank you Rad for everything you're doing here! Essentially yes. The Grand Cross symbolizes all kinds of existing dynamics within the Soul that have come to a head in the way you are stating it. Thus, the Soul has a choice to make in order for it's evolution to either proceed or not. I don't mean to bother you but I was wondering whether you missed my post above and Ari's. As always, any insight you can share will be very much appreciated. Yes, but it's more than just a 'glimpse'. It's a total understanding of what has come before, and why. The polarity of any sign is contained with the sign itself. If a Soul is making choices to evolve then that natural polarity will occur as a result. Thus, the existing aspects between two planets that are symbolized by the Soul's past that is being brought forwards into the current life are continuing to evolve relative to the archetypal nature of the aspects and the phases they take place within. For instance, using the balsamic semi-square that Ari referred to (not necessarily the charts posted above), let’s suppose Saturn is making a 314 degrees aspect to the SN (balsamic semi-square but still in the last quarter phase). Of course this aspect needs to be interpreted in the context of a person’s entire chart, but nevertheless we can infer from it that in its past the Soul wanted to have the freedom to initiate whatever experiences were considered necessary so as to get closer to the distant horizon it inwardly sensed. Furthermore we can assume that the external obligations and duties that were inherent to the establishment of the Soul’s personal authority within the context of society (Saturn) were perceived to be very annoying and were viewed as potential detours that prevented the Soul from getting to that distant horizon that promised only freedom. No, your assumptions are just that: assumptions. Your assumptions are assuming one possible manifestation of this aspect. Relative to your assumptions, that would be the case. No, because in the example you have posited the two planets are not themselves square the Nodal Axis. Thank you so much--I am extremely grateful for your time and patience. Hi Rad, I have deleted my last post. Hi Rad, I have another chart here I'd like to look at in regards to sesququads with the nodes. In this case it involves the MC/IC axis. MC gibbous phase sesquiquad the nn and the IC gibbous phase sesquiquad the sn. The fact of the IC/MC being involved means that there was a dynamic that has manifested in the CURRENT LIFE according to the current evolutionary needs of the soul. Is that an accurate assesment, since the IC/MC is specific to the current life? This would relate to her early nurturing experience and her social conditioning/imprinting. The IC, ruled by Taurus Moon in the 12th sesquiquad the sn in Pisces in the 11th, which is ruled by Neptune in Pisces in the 8th. Taking into account the squares to the nodes in the 7th and 8th all relative to the core intention of Pluto in the 6th: There have been various traumas and emotional shocks that this soul has experienced in the past that have lead the soul to feel incredibly powerless and vulnerable. She has also been learning the ongoing lesson of letting go of the need for control, and thus she has responded to these shocks by way of disconnecting and entering into "work mode" that has manifested as having dissociated from her own family based on the emotional overwhelm of what has occured (ic gibbous sesqui sn). Implied in this is that she has also taken advantage of other's based on unconscious motives - and in so doing has attracted abandonment and great loss. This has then lead to the fear of getting too close to anyone. So linking that sn to the IC this would imply emotional fracturing, dissociation and as a result of that being emotionally unavailable to "family" and those that need her. And in the current life, that has manifested via a mother who was emotionally overwhelmed and checked out. Thus this soul has early on learned to protect herself and not become too vulnerable - all to avoid the unresolved trauma. Is it accurate to say that she had exemplified such patters with her own family in prior lives and that the fact of the IC/MC axis being involved means that it can intensify if it is not dealt with in this life? IE that it can manifest as something like an actual Moon or Saturn sesqui/semi square to the nodes? I'll keep it here for now. I just want to see if I am approaching and understanding the implications of this signature. Thank you so much.